My Molecular Pathways feature has just been accepted for publication in Clinical Cancer Research. 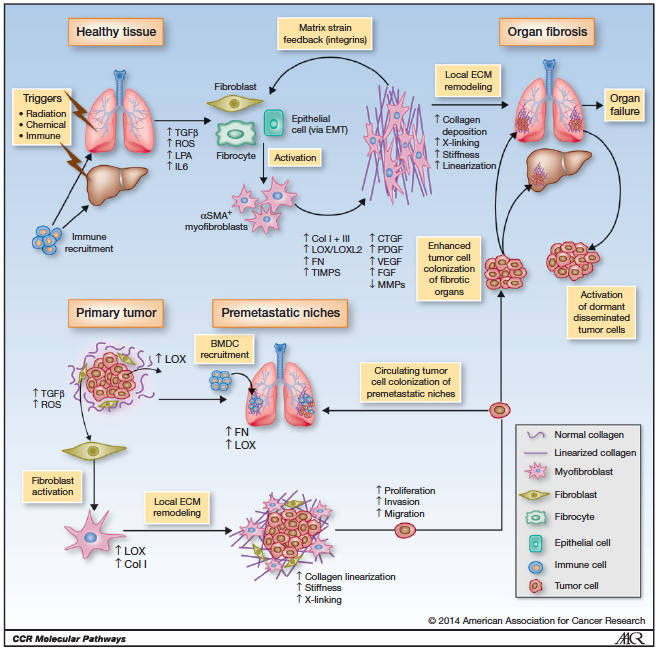 Titled Molecular Pathways: Connecting Fibrosis and Solid Tumor Metastasis it discusses the current and recent work in the field looking at the overlap between mechanisms underlying two pathological diseases; cancer and tissue fibrosis. Both cancer and tissue fibrosis are inexplicably linked, sharing many of the same molecular pathways. Indeed, one often leads to the other, and understanding the commonalities between these two devastating diseases is critical to the development of new therapeutics for patients. Given the significant overlap in pathways associated with fibrosis and cancer, summarised in the figure above, we argue that we should simultaneously evaluate agents that target both the tumour microenvironment and tissue fibrosis for potential roles in both settings. This feature has also been selected for AACR’s Clinical Cancer Research journal-based Continuing Medical Education (CME) program. This entry was posted in Research Publications, Reviews on July 16, 2014 by Matrix and Metastasis.